Home of the 2015 U.S. Open June 15-21, 2015 In keeping with the traditions of the game and the natural style of links golf, Chambers Bay was designed as a walking-only golf course. Experience Chambers Bay the way the game was originally created. By choosing one of our professionally trained caddies to carry your bag during your round, you will be able to entertain all the surrounding views of the Puget Sound. This 18-hole championship golf course, designed by Robert Trent Jones II is a must play. Nestled against the shores of Puget Sound in University Place, Washington, Chambers Bay is a spectacular setting and caters to golfers of all levels providing a world class golf experience. 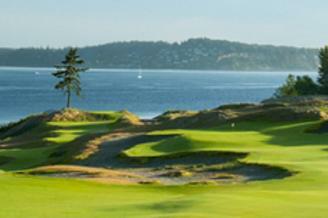 Chambers Bay is a public course, and the first course in the Pacific Northwest to host the U.S. Open.